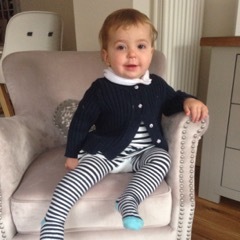 My Holly…How are you seventeen months old! I can’t remember life without my little shadow and when I look at you, I see ‘me’ looking back…which is strange, but lovely all rolled up! When the front door opens and in walks someone you love, you run to the door with your arms out, waiting for them to scoop you up for a cuddle! You are nosey…taking you shopping is easy, you love to sit in your pushchair and watch the world go by! You love to play with your babies, giving them a cuddle, feeding them and pushing them in the pram. You love to eat..oh boy, do you love to eat!! I can’t fill you up…you are always taking my hand and leading me to the kitchen for more food! You are happy to play on your own, chatting away in your little world…I could watch you for hours. I love it when you crawl onto my lap and take my hand to put round you for a cuddle…you hang on tight to my hand and I get a tear in my eye every time. You snore when you first go to sleep…its the cutest sound. You are my little book worm! You will push your way onto my lap, no matter what I am doing and hand me the book you want me to read to you…your favourite at the moment is ‘The hungry caterpillar’. You love your sister more than anything…when Alice is at school you wander round the house saying ‘Alice’. You love the walk to pick Alice up from preschool and when she walks out with her teacher, you run up and give her the biggest hug. You love bags more than anything…just like mummy!! You love to go on the swings and I can never get you off! Previous Post: « Meet a Mum…Television Presenter Laura Hamilton!